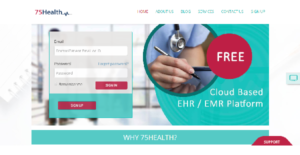 75Health is a cloud-based, integrated Electronic Health Records and Electronic Medical Records system designed to help medical facilities, hospitals, clinics, and other similar establishments graduate from paper-based record management practices to a modern and digital solution of creating, organizing, and accessing medical records. With 75Health, medical professionals such as doctors, therapists, and psychiatrists can easily create profiles of their patients or clients, track their progress, monitor their medication, and schedule their appointments. It makes messaging between medical and healthcare professionals and their patients a breeze. Hospitals and clinics are able to bill their patients with pinpoint accuracy as everything is transparent, centralized, and updated. Simply put, 75Health helps make medical practice management more reliable and efficient for institutions and professionals. 75Health enables your medical practice to create electronic profiles of your patients and store them in a secure, cloud-hosted hub that you can access anytime, using any device. It eliminates the need of manually entering patient information onto a paper form, slide it inside a folder, and store it in a file cabinet. With 75Health, all you have to do is perform a quick search and you’ll get your patient’s profile in seconds. You can make quick changes such as new medication or schedule an appointment with ease. No more rummaging through cabinets and folders, entering the wrong information or forgetting to update your patient’s data. Doctors rely heavily on the information presented to them to make the right diagnosis and prescribe the right medication to ensure that the patient is treated right and recovery is achieved. With 75Health, doctors can access a patient’s medical record and even his or her entire medical history so they can make data-driven decisions instantly. They can monitor the progress of their patients and determine whether their prescribed treatment is effective or not. Having such instant access to reliable information makes doctors more effective in their tasks. In cases where multiple doctors are needed, it is imperative that they share the same version of information and be able to communicate with each other whenever they have other findings and suggestions. 75Health gives them a platform where they have access to reliable, unified patient information. This feature enables them to work closely with each other, achieve and maintain better workflow to ensure patient recovery. The billing process can be quite exhausting and time-intensive, especially in hospitals that rely on paper-based documents for billable information. 75Health centralizes all patient data for easy storage and access. Billing departments can easily gather all billable information and generate bills without worrying about accuracy. What Problems Will 75Health Solve? Cloud-Based: The biggest issue of accessibility is addressed automatically because 75Health is cloud-based and available on all devices. Easy to use: Simple UI makes it easier to adapt and does not require a prolonged training session. Affordable: Cost involved in installation and usage is eliminated because of the competitive price offered by 75Health. If you are considering 75Health it might also be sensible to examine other subcategories of Best EHR Software listed in our database of SaaS software reviews. Each enterprise is different, and might need a specific EHR Software solution that will be designed for their business size, type of clients and staff and even particular industry they deal with. You should not count on locating an ideal app that will work for every company regardless of their background is. It may be a good idea to read a few 75Health reviews first and even then you should remember what the service is intended to do for your company and your employees. Do you require a simple and straightforward service with only essential functions? Will you really make use of the advanced functionalities needed by pros and large enterprises? Are there any specific features that are especially useful for the industry you work in? If you ask yourself these questions it will be much easier to find a solid software that will match your budget. How Much Does 75Health Cost? Contact 75Health for information on their basic and enterprise pricing options. You can also sign up for a demo to see if the software matches your business. We realize that when you make a decision to buy EHR Software it’s important not only to see how experts evaluate it in their reviews, but also to find out if the real people and companies that buy it are actually satisfied with the product. That’s why we’ve created our behavior-based Customer Satisfaction Algorithm™ that gathers customer reviews, comments and 75Health reviews across a wide range of social media sites. The data is then presented in an easy to digest form showing how many people had positive and negative experience with 75Health. With that information at hand you should be equipped to make an informed buying decision that you won’t regret. What are 75Health pricing details? What integrations are available for 75Health? If you need more information about 75Health or you simply have a question let us know what you need and we’ll forward your request directly to the vendor.